mCUE™ VoLTE is a mobile client software solution for IMS IP communications under Android™ and iOS™. The industry’s first over-the-top (OTT) IP communications client to be deployed by a 4G mobile operator, mCUE™ VoLTE is field proven and provides carrier-grade voice and video quality. It supports both Voice over LTE (VoLTE) / IR.92 and Video over LTE (ViLTE) / IR.94 standards to deliver HD voice, real time HD video call, SMS-over-IP and VCC on 4G/LTE mobile networks. 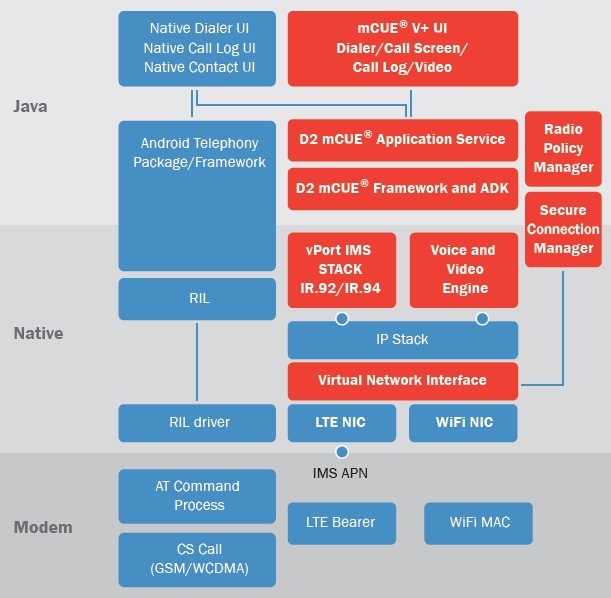 Through tight integration and optimization on Android, mCUE™ VoLTE helps carriers and device manufacturers quickly create new products such as smartphones, tablets, media phones and other mobile devices that deliver today’s most in-demand IMS communications features. mCUE™ VoLTE is a mobile client software solution for IMS IP communications under Android™ and iOS™. It supports both Voice over LTE (VoLTE) / IR.92 and Video over LTE (ViLTE) / IR.94 standards to deliver HD voice, real time HD video call, SMS-over-IP and VCC on 4G/LTE mobile networks. Through tight integration and optimization on Android, mCUE™ VoLTE helps carriers and device manufacturers quickly create new products such as smartphones, tablets, media phones and other mobile devices that deliver today’s most in-demand IMS communications features. The industry’s first over-the-top (OTT) IP communications client to be deployed by a 4G mobile operator, mCUE™ VoLTE is field proven and provides carrier-grade voice and video quality. It provides all key layers from the UI, protocol stacks, down to a fully embedded media engine, which incorporates a complete suite of VoIP and Video DSP module, including wideband CODECs and an optimized integrated video framework that supports native hardware video acceleration. mCUE™ V+ is a complete mobile client software solution for IMS IP communications under Android™ and iOS™, supporting both VoWiFi / WiFi Calling and ePDG gateway to deliver HD voice, real time HD video call, SMS-over-IP and VCC on WiFi or Mobile networks. Through tight Android™ system integration and optimization or as over-the-top (OTT) communication application on iOS™ system, mCUE™ V+ helps carriers and device manufacturers economically create new products such as smartphones, tablets, media phones and other mobile devices that deliver today’s most in-demand voice / video calling services. With 4G/LTE deployments revolutionizing the user experience and improving carrier profitability, D2 is uniquely positioned to ensure that its customers successfully create and deploy mobile services and devices that deliver the highest quality of VoWiFi / WiFi Calling feature in the market. The industry’s first IP communications client, mCUE™ V+ is field proven and provides carrier-grade level voice and video quality. It is a complete communications client, providing all key layers from the UI and protocol stacks to a fully embedded media engine with a complete VoIP and Video DSP functions from wideband CODECs to an optimized video integration framework that supports native hardware video acceleration. mCUE™ RCS is designed for Green Button, Preloadable, and Downloadable Client Software for Rich Communication Services for Android™ and iOS™ platforms. It supports voice call, video call, message, file transfer, presence, and other GSMA RCS standards. The over-the-top (OTT) based down-loadable and pre-loadable mCUE™ RCS client enables operators to offer high quality voice and video services, as well as many additional Rich Communications Services such as Instant Messaging, Media and Location sharing over WiFi, 3G, and 4G/LTE. Its flexible architecture also provides a migration path to Green Button Native implementations, when required.